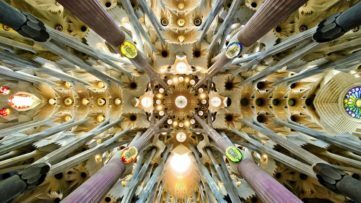 You don’t have to be an expert in architecture and design to acknowledge someone’s talent and vision. For years, the best museums in the world were places where people come to see art and enjoy its importance. 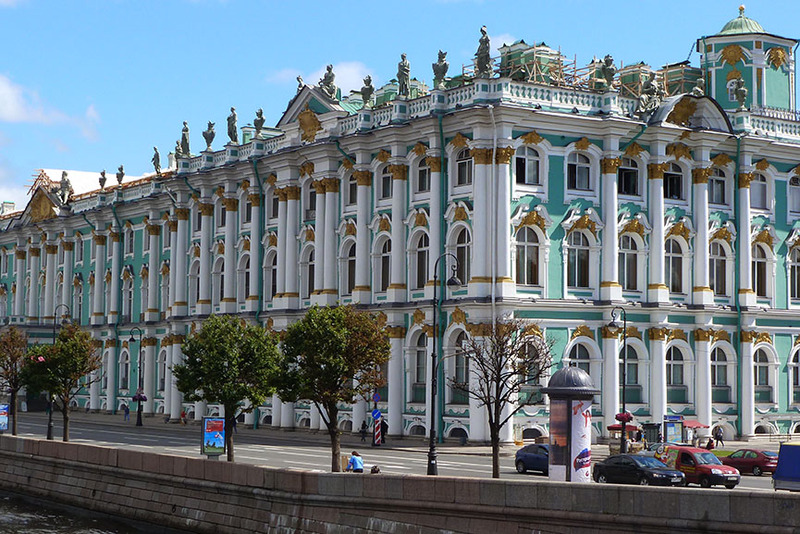 However, in the last couple of decades, museum buildings became art as well. 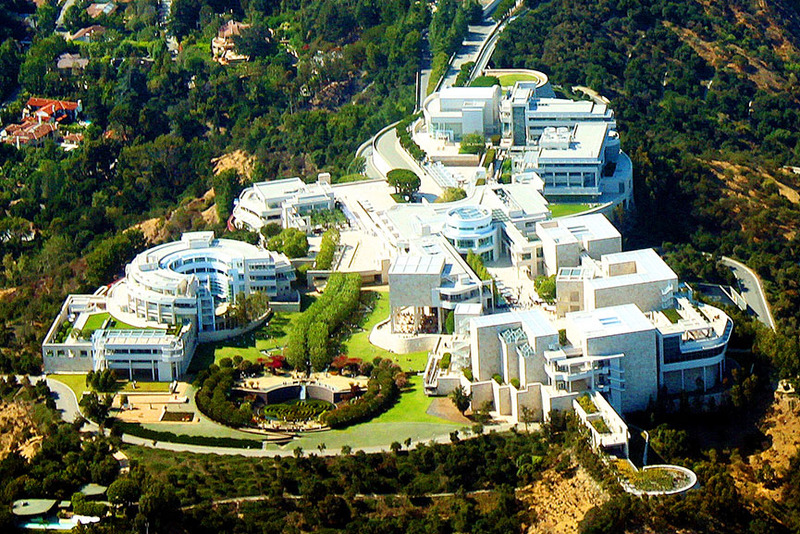 Thanks to the engagement of some of the world’s best architects, buildings in which museums were planned were given more though than ever before. 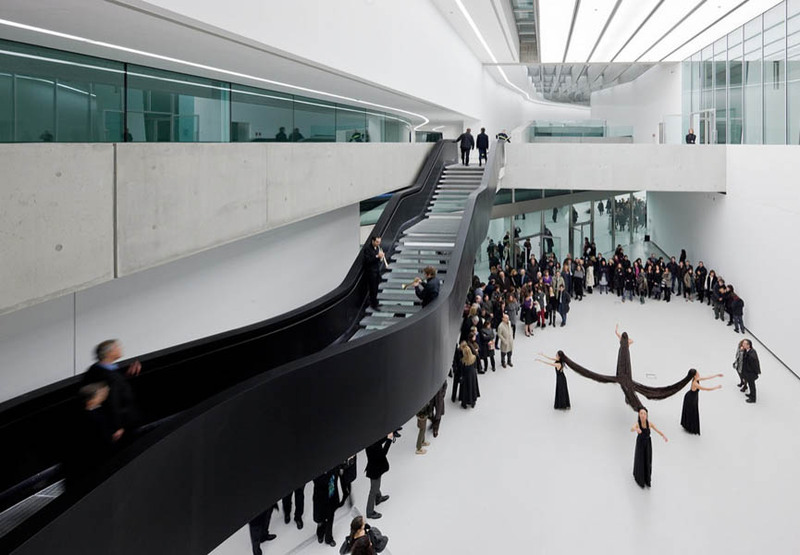 Thinking properly that great art needs an equally great space, we’ve been witnesses to many stunning architectural ventures sprouting all over the world. They defy gravity, look surreal, the shapes and forms are beyond all expectations and still, years in front of us suggest there will be even more surprises. Sometimes, it is their historic importance or the surrounding nature what makes them special too! 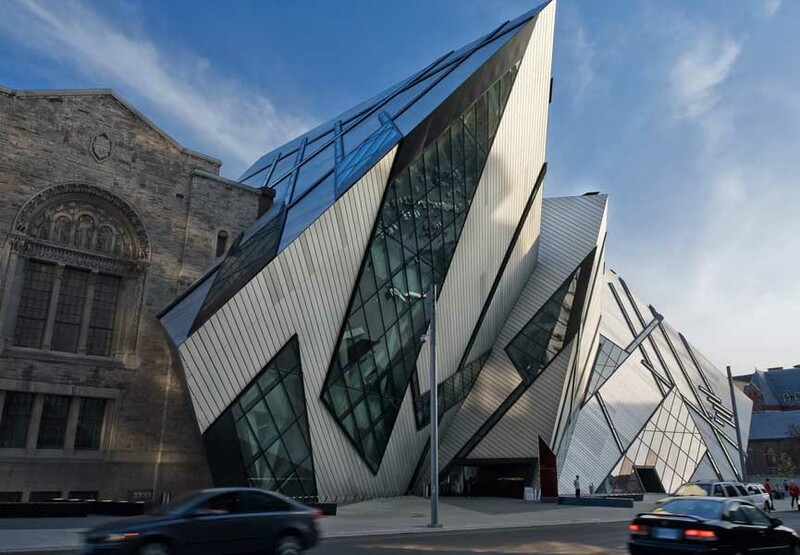 From Spain, Austria, Italy and Belgium to United States, Canada and Australia, everywhere you go you can find at least one of these spectacular museums. Of course, the experience isn’t complete without their extraordinary collections and artist studios they often house as well, which gives us all the more reason to visit them, and more than once too! 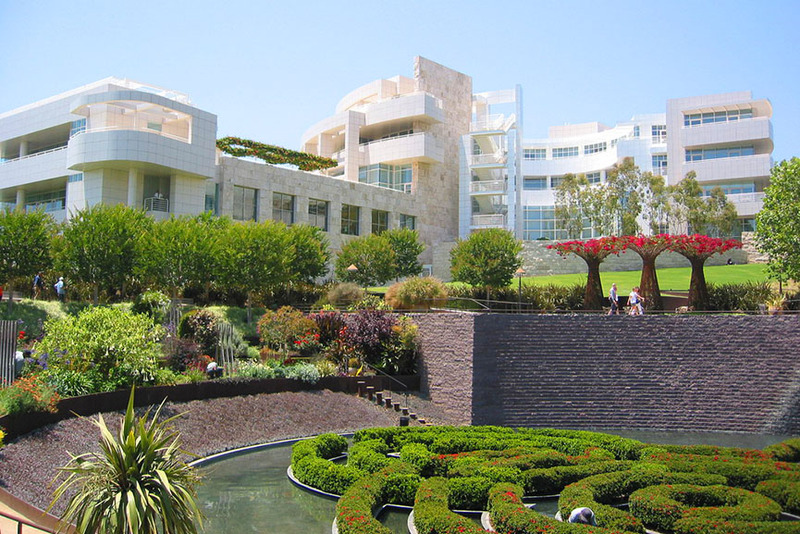 Which art museum is your absolute favorite? Even before its official opening on October 19, 1997, the new museum was already making news as many artists, architects, journalists and experts in numerous fields that visited the construction during its four years of the making anticipated the success. 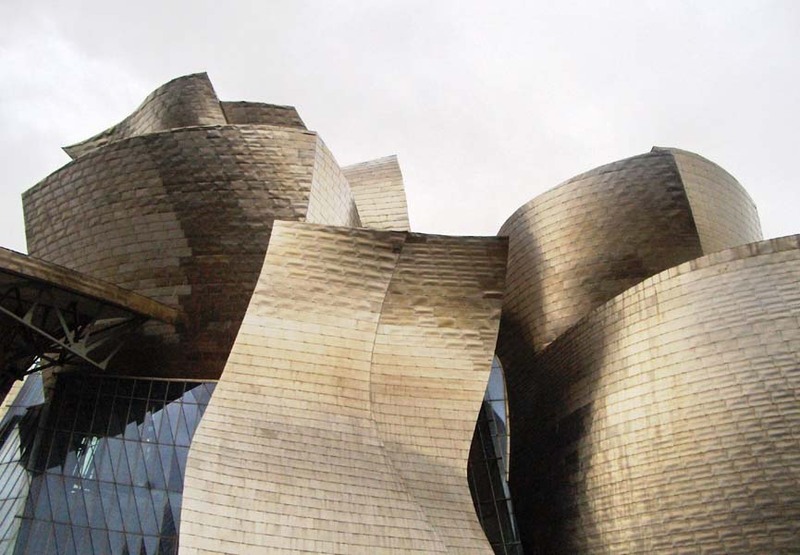 Calling it the greatest building of our time by architect Philip Johnson due to the fantastic idea of Frank Gehry, Guggenheim Museum Bilbao met all expectations and even more so. 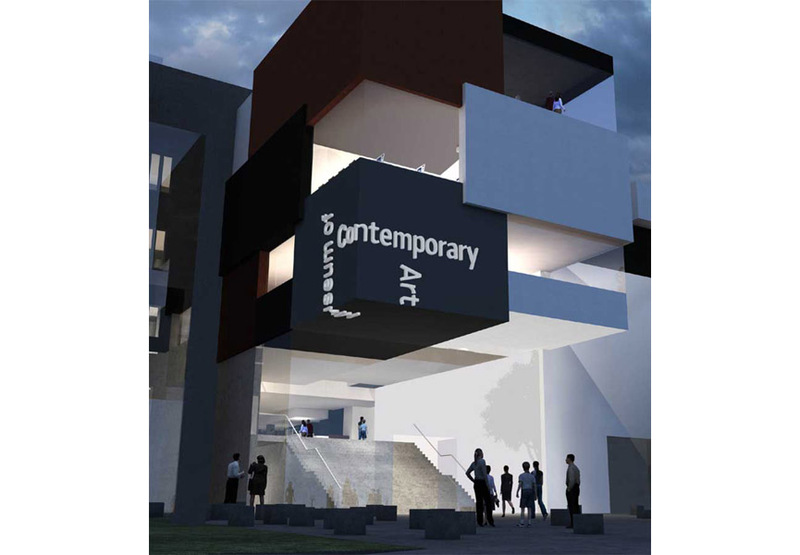 The final result was a futuristic look, which changed the way people thought about museums and art spaces in general. It was one of the first successful attempts to connect art, architecture and collecting. 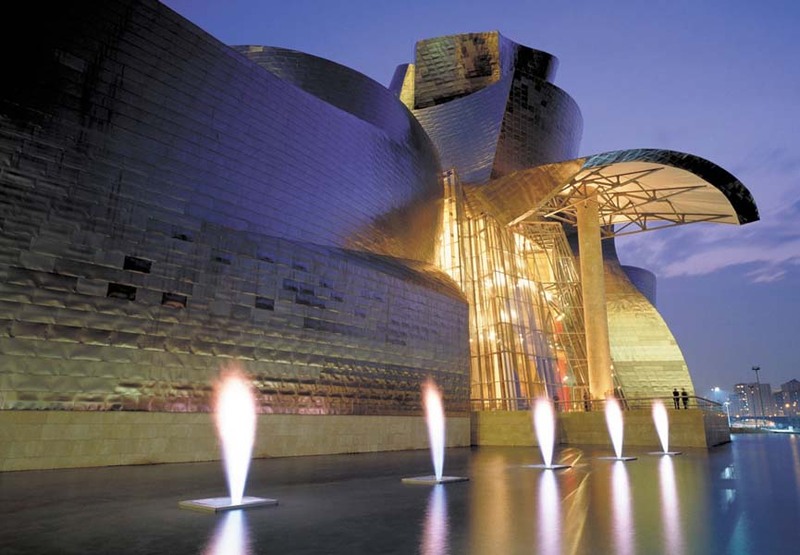 Located in the Basque city of Bilbao in northern Spain, this 32,500-square-meter structure is made of titanium, glass, and limestone is seamlessly integrated into the urban context along the Nervión River in the old industrial heart of the city. 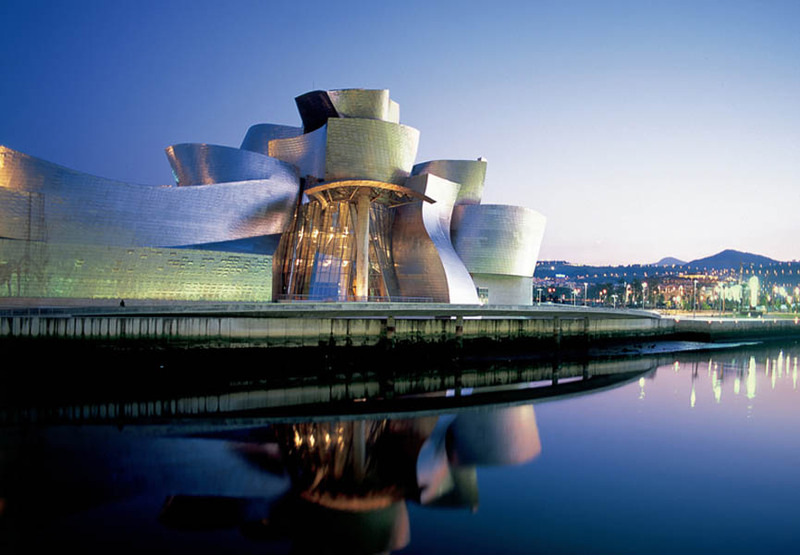 The Guggenheim Bilbao’s collection spans from the mid-20th century to the present day, concentrating on postwar painting and sculpture in America and Europe. The collection includes key works by significant artists including Anselm Kiefer, Willem de Kooning, Robert Motherwell, Gilbert & George, and Richard Serra. Be sure to check out artworks by Willem de Kooning on our marketplace! Featured images via oddcities.com and carrigmanblog.wordpress. 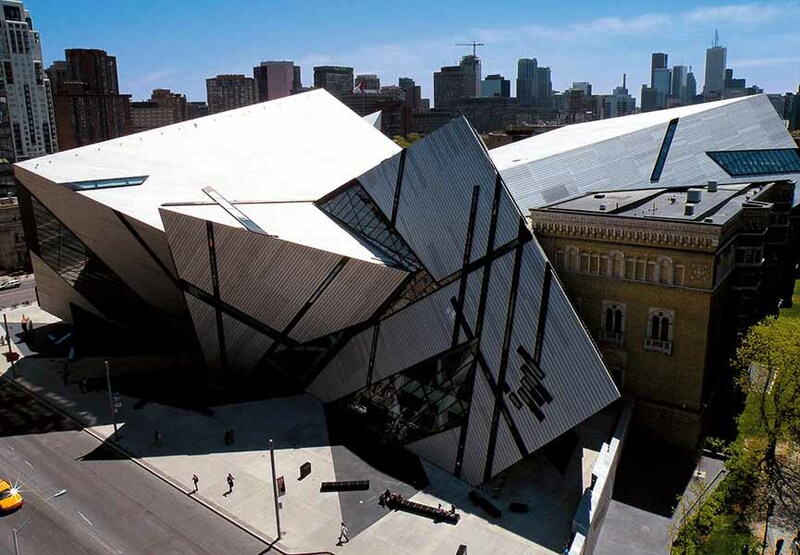 With a staggering number of over one million visitors a year, The Royal Ontario Museum ranks, besides one of the most beautiful, as one of the largest museums in North America. Located north of Queen’s Park, in the University of Toronto district, the museum is primarily focused on world culture and natural history. 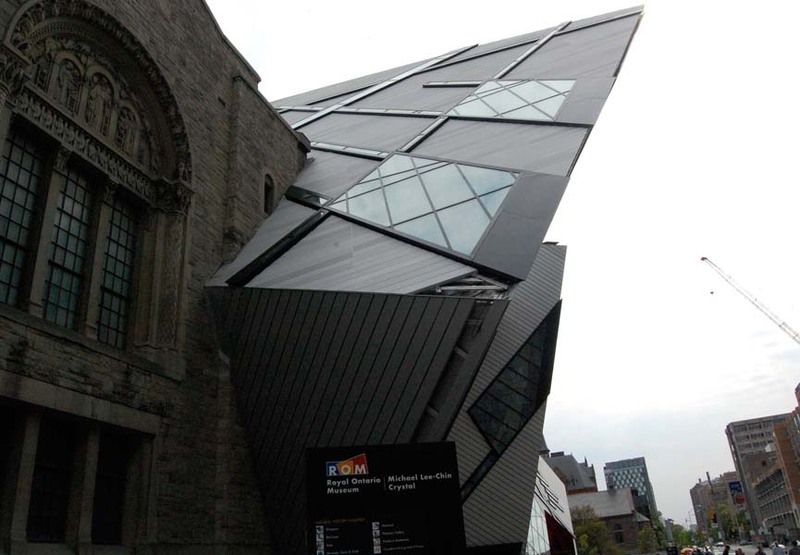 Even though it first opened on March 19, 1914, The Royal Ontario Museum became an independent institution in 1968, when it segregated from the University of Toronto. Today, it also represents Canada’s largest field-research institution, with research and conservation activities that span the globe. 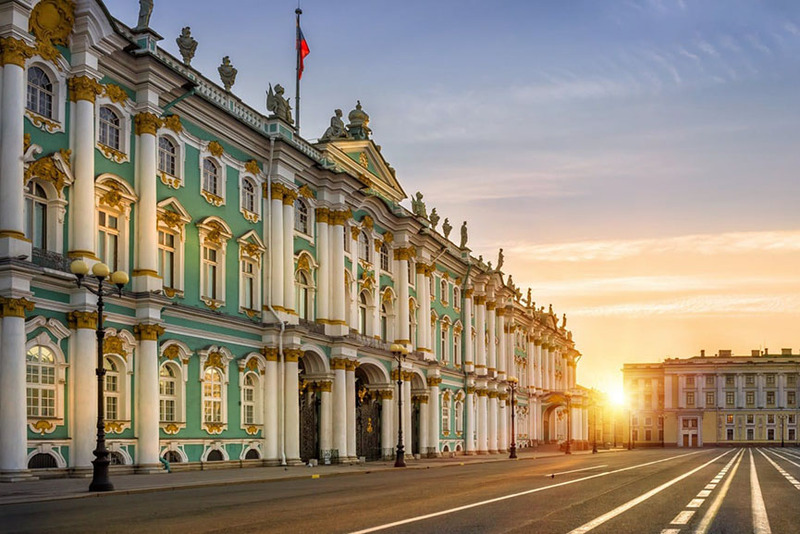 Thanks to the enormous collection of over six million items and forty galleries, the museum is highly respected and perceived as a renewed cultural institution of great importance. Besides the notable collections of dinosaurs, minerals and meteorites, Near Eastern and African art, Art of East Asia, European history, and Canadian history, it also contains an extensive collection of design and fine arts, including clothing, interior, and product design, especially Art Deco (for Art Deco inspired art, click here). 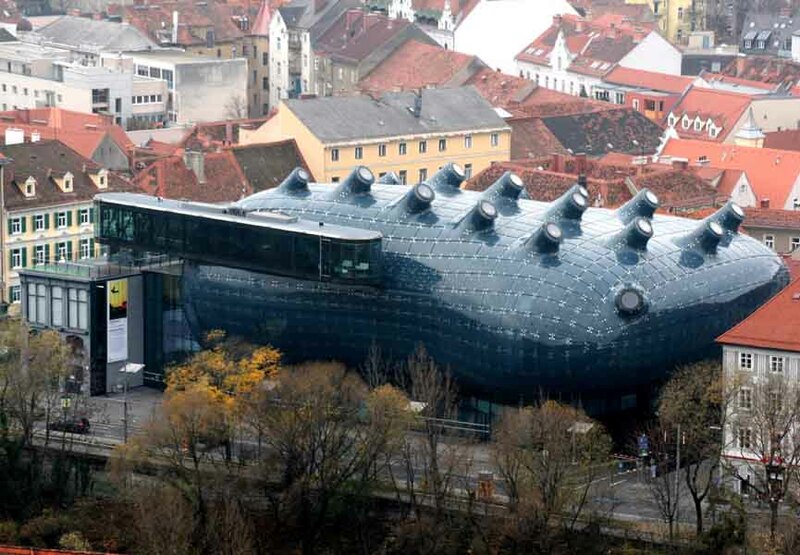 One of best examples of European architectural undertakings is The Kunsthaus Graz or Grazer Kunsthaus, located in Austria. Built as part of the European Capital of Culture celebrations in 2003, the museum has since become a true landmark of Graz. 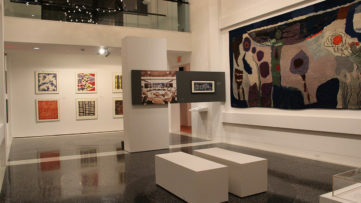 Its exhibition program specializes in contemporary art of the last four decades. Its unusual form differs radically from conventional exhibition contexts, many of which maintain the traditions of the modernist White Cube. 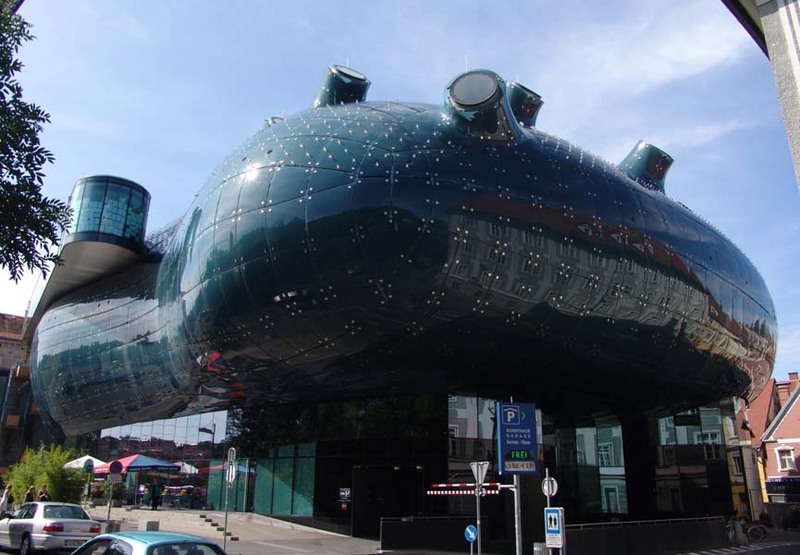 The team of architects working on the museum used the innovative type of architectural design called blob architecture. It refers to a wavy and curvy design without traditional edges or traditional symmetric form. Therefore, the enormous building by its creators Colin Fournier and Peter Cook the Friendly Alien, consciously stands out against the surrounding baroque roof landscape with its red clay roofing tiles but nevertheless integrates the façade of the 1847 iron house. Besides the creative exterior, The Kunsthaus Graz also has an innovative concept – it doesn’t collect and maintains no permanent exhibitions. Its only purpose is to present and procure contemporary art productions. As another Guggenheim museum on the list, the New York version has an interesting background story. 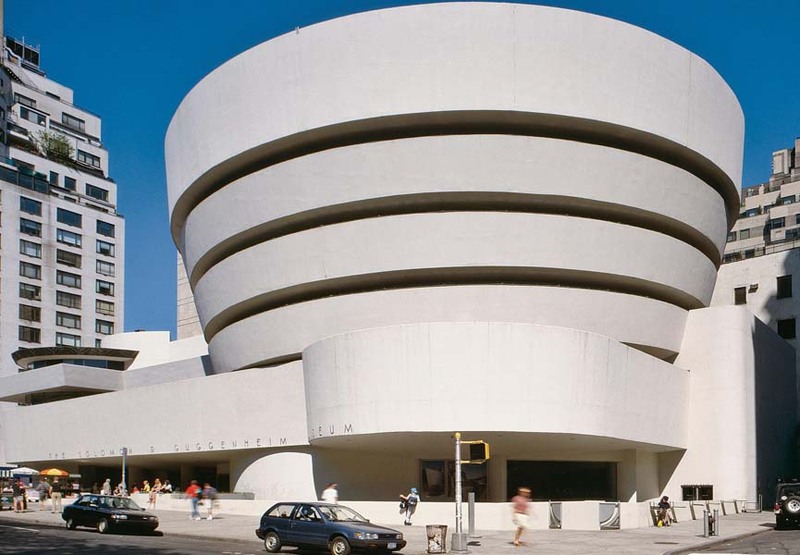 In 1943, architect Frank Lloyd Wright received a letter from Hilla Rebay, the art advisor to Solomon R. Guggenheim, asking him to design a new building to house Guggenheim’s four-year-old Museum of Non-Objective Painting. 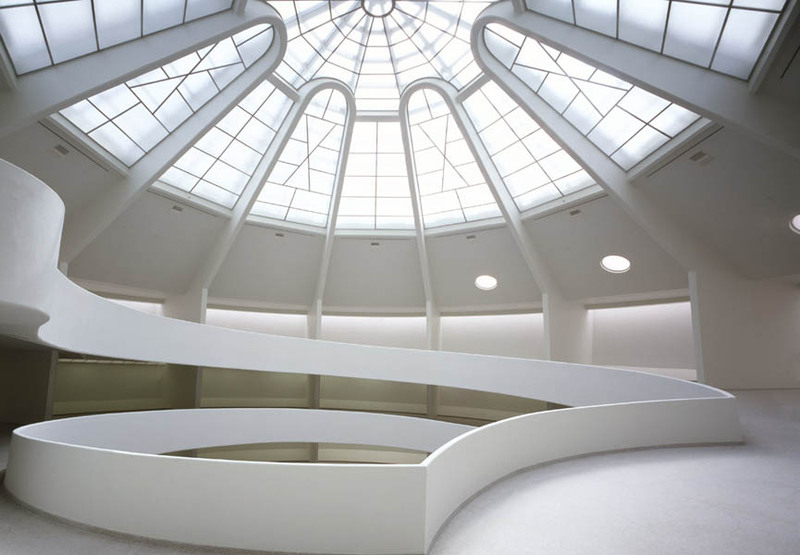 Despite Wright’s dissatisfaction with Guggenheim’s choice of New York for museum’s location, due to the city’s overpopulation, he decided to proceed with his client’s wishes. He eventually choose Fifth Avenue as its location, emphasizing the proximity to Central Park as the key factor. Although both Guggenheim and Wright would die before the building’s 1959 completion, Wright’s work up until that point testifies to his architectural genius as well as the adventurous spirit that characterized its founders. It’s the permanent home for incredible collection of Impressionist, Post-Impressionist, early Modern and contemporary art, with many exhibitions over the year. 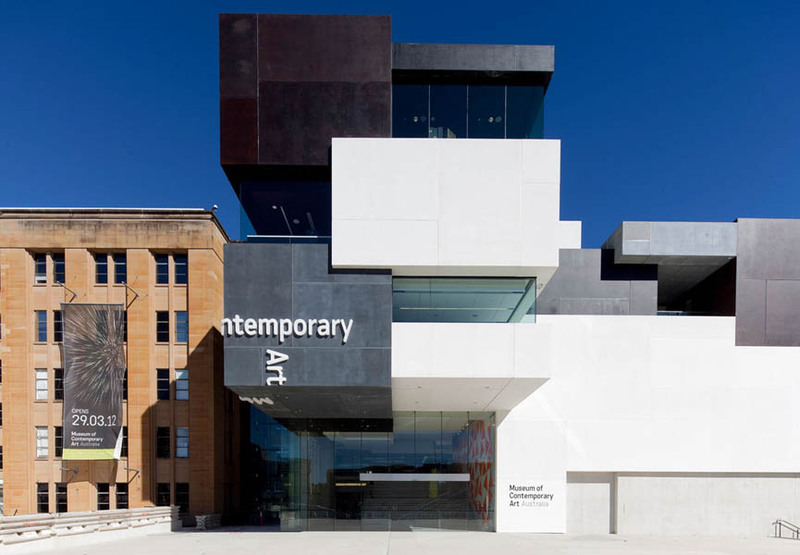 One of Australia’s architectural delights is the Museum of Contemporary Art located in Sydney. Solely dedicated to exhibiting, interpreting and collecting contemporary art, both local as well as international, the museum underwent major changes since its opening in 1991. After the relocation to a bigger space in 2005, the audiences still continued to grow and programs expanded, creating difficulties in implementation of the program. This is why in August 2010, the museum expanded and redeveloped by Sydney architect Sam Marshall in association with the New South Wales Government Architect’s Office. 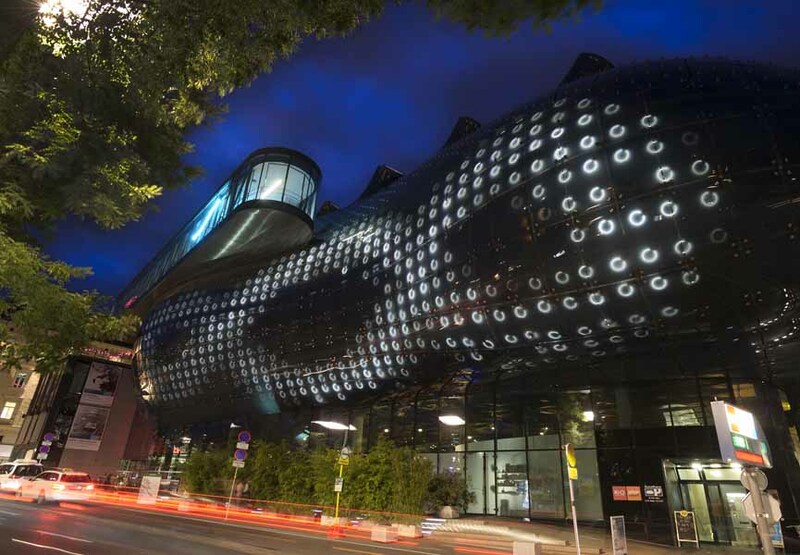 The refurbished building, which opened in March 2012, increased the MCA’s total size by almost 50 per cent with the addition of 4,500 square meters, including a new five-floor wing. The museum collection contains over 4000 works by Australian artists that have been acquired since 1989. It collects across all art forms with strong holdings in painting, photography, sculpture, works on paper and moving image, as well as significant representation of works by Aboriginal and Torres Strait Islander artists. 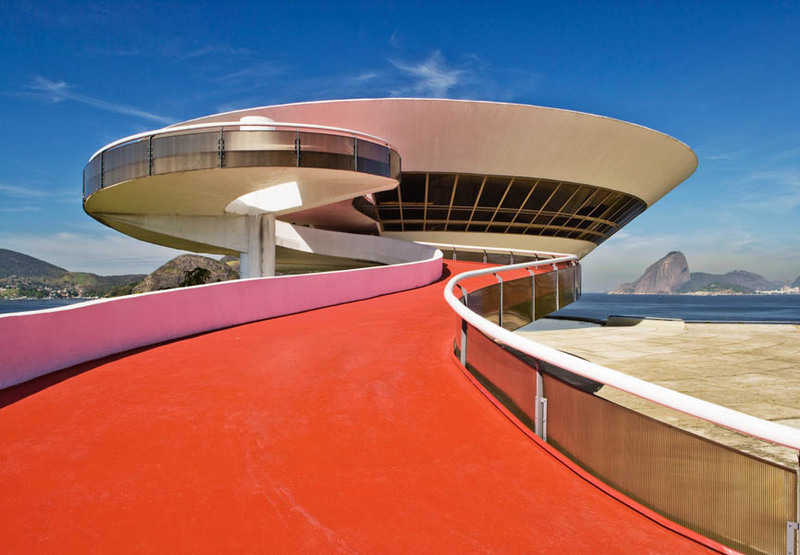 Looking almost surreal or something you would expect to see in a science fiction movie, Brazilian Niterói Contemporary Art Museum is definitely one of the most impressive museum buildings you’ll ever see. 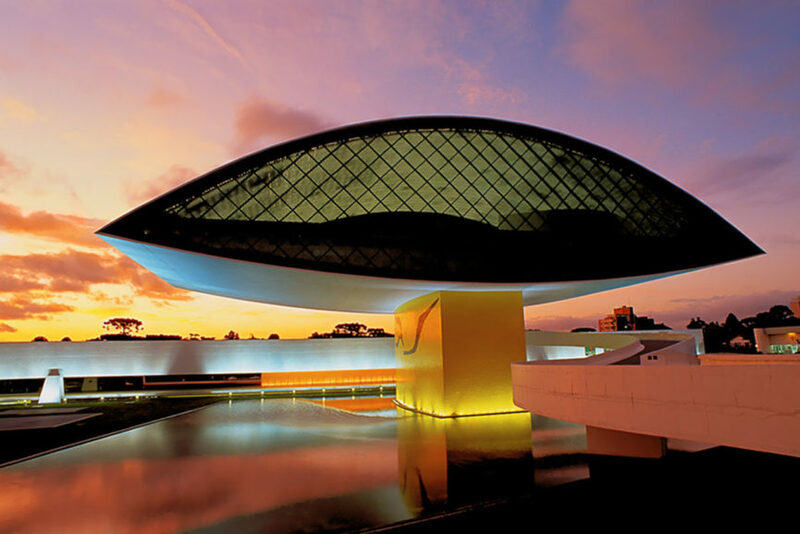 Located in the city of Niterói, Rio de Janeiro, Brazil, the museum was completed in 1996 as the design of Oscar Niemeyer with the assistance of structural engineer Bruno Contarini. 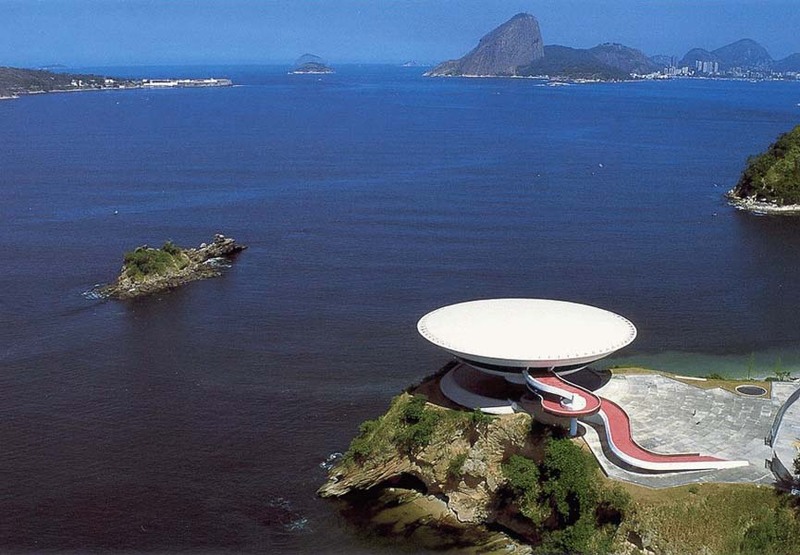 Niterói Contemporary Art Museum is 16 meters high and its cupola has a diameter of 50 meters with three floors. Resembling a UFO or, viewed from above as a giant octopus, it is set on a Cliffside, at the bottom of which is a beach. 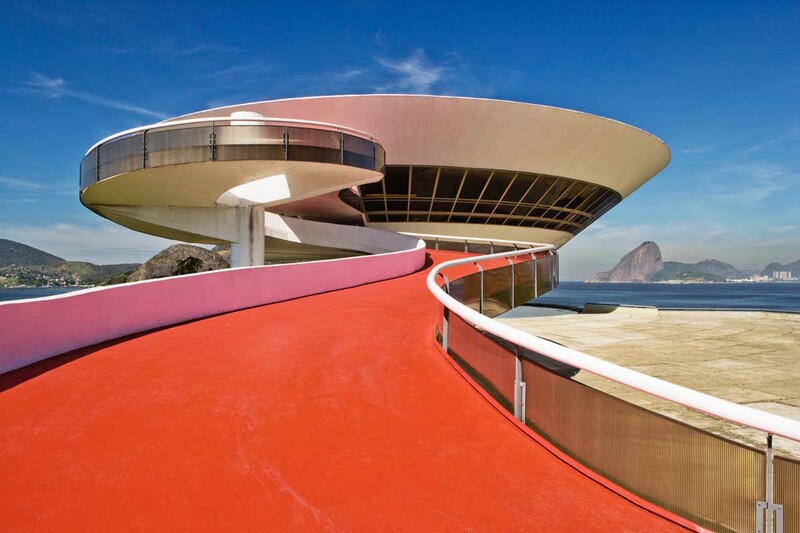 Despite this speculations concerning the inspiration for the shape, Niemeyer’s intention was for the form to emerge “from the ground” and “continuously grow and spread,” like a flower that rises from the rocks. The permanent collection are in the museum on a renewable loan from Joao Sattamini, a Brazilian private collector who has amassed one of the biggest private collections of worldwide and Brazilian contemporary art in the world. 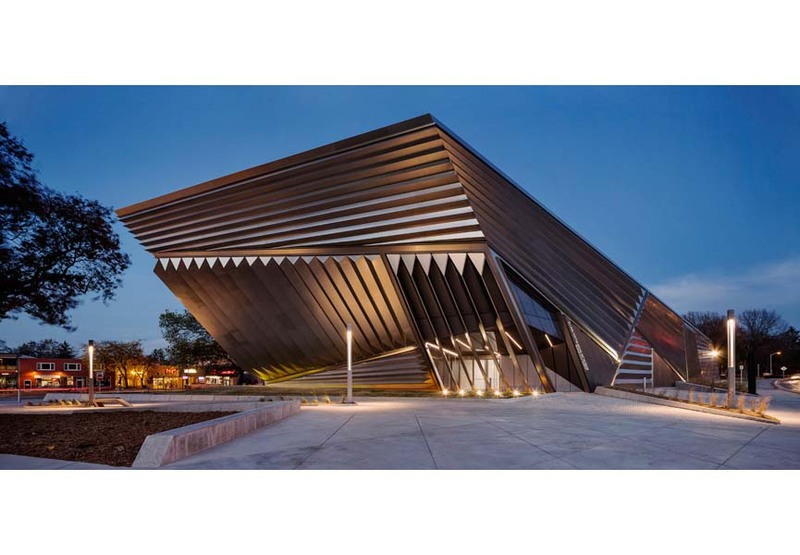 Thanks to the generous donation of 26 million dollars from businessman Eli Broad and his wife Edythe for the replacement of the old Kresge Art Museum in the school’s art building, Michigan State opened a new one and called it The Eli and Edythe Broad Art Museum (colloquially The Broad MSU, not to be confused with The Broad in Los Angeles). 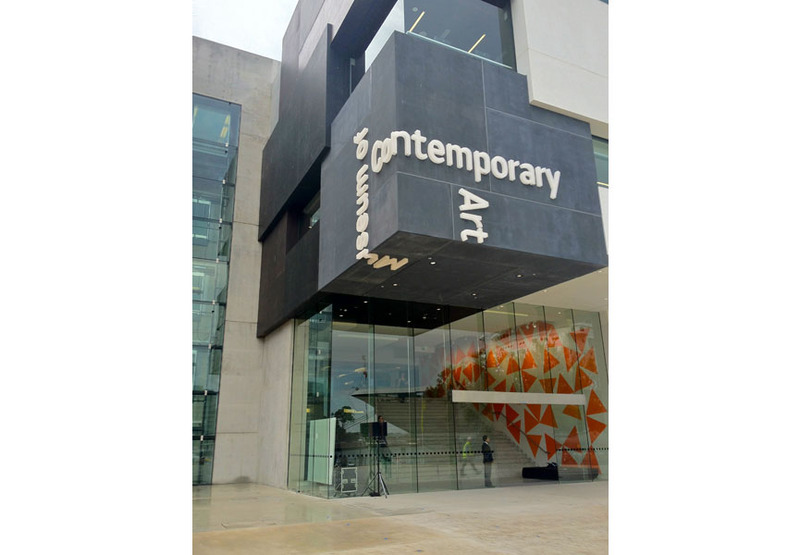 After naming Micheal Rush as the founding director, the contemporary art museum opened its doors for the first time in November 2012. 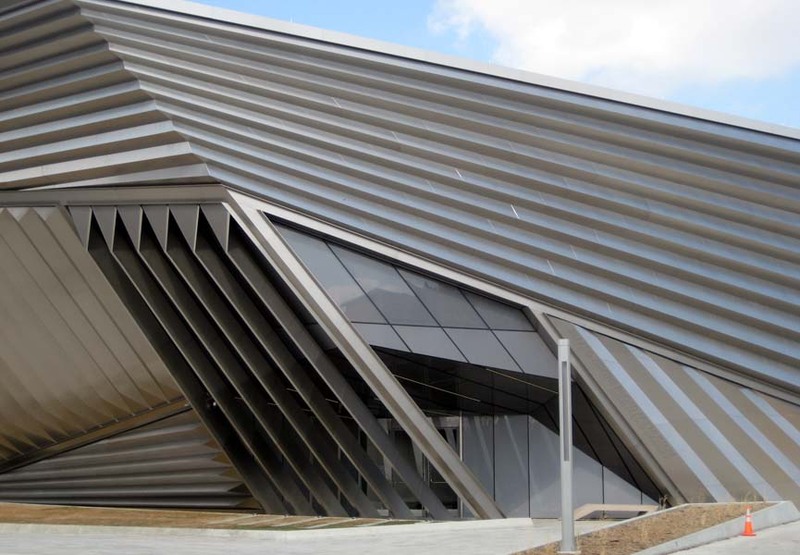 Designed by Pritzker Prize-winning architect Zaha Hadid, the museum features a striking facade of pleated stainless steel and glass, signaling the museum and the university’s dynamic vision. With the intention to give the building an ever-changing appearance that arouses curiosity yet never quite reveals its content, Zaha Hadid managed to do just that. Seventy percent of the 46,000 square feet is dedicated to the exhibition space, and the collection spans cultural production from ancient Greece, Rome and pre-Columbian cultures through Medieval and Renaissance art to the modern and contemporary. 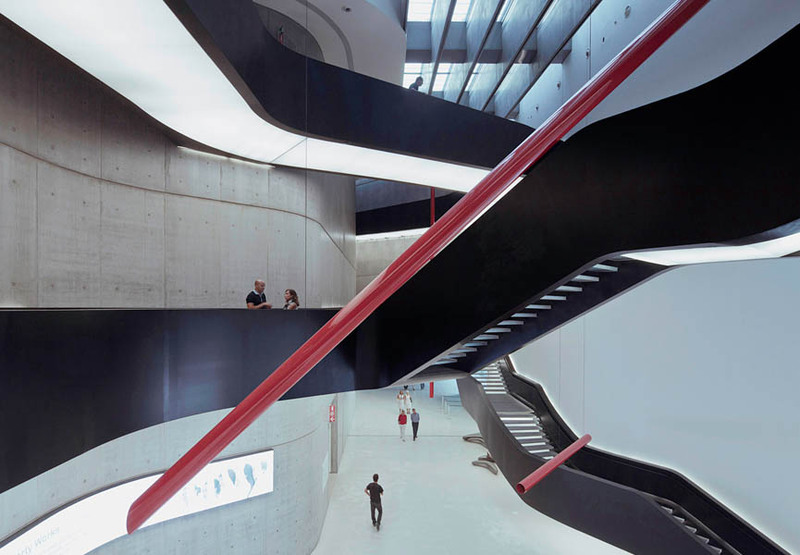 Although it may not seem that architecturally challenging, the biggest surprise of Italian MAXXI museum comes from its interior. This National Museum of Art of the 21st Century located in Rome is the first Italian museum dedicated to the art of today. Since its establishing in 2010, three years later the museum already had 300,000 visitors. 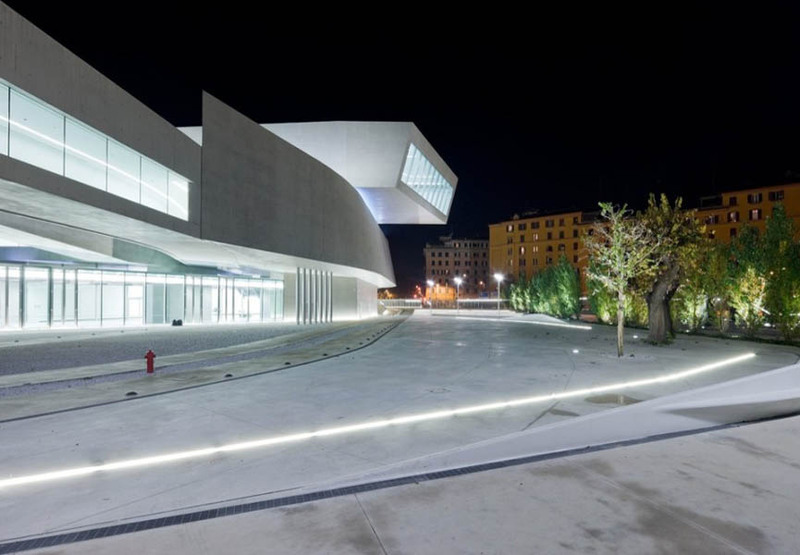 A brain child of the same designer who created Eli and Edythe Broad Art Museum, Zaha Hadid, the building is 290,626 sq ft. Called by The Guardian as Hadid’s finest built work to date and a masterpiece fit to sit alongside Rome’s ancient wonders, the MAXXI was conceived as a space for excellence in contemporary creativity. The array of media spans from painting and installations to video art, sculptures and photography. MAXXI Art’s collection boasts names the likes of Alighiero Boetti, Francesco Clemente, William Kentridge, Mario Merz, Gerhard Richter, Ed Ruscha; meanwhile the period of production ranges from the 1970s to 2000s, but also makes room for emerging artists. View and explore an interesting selection of works by Ed Ruscha! 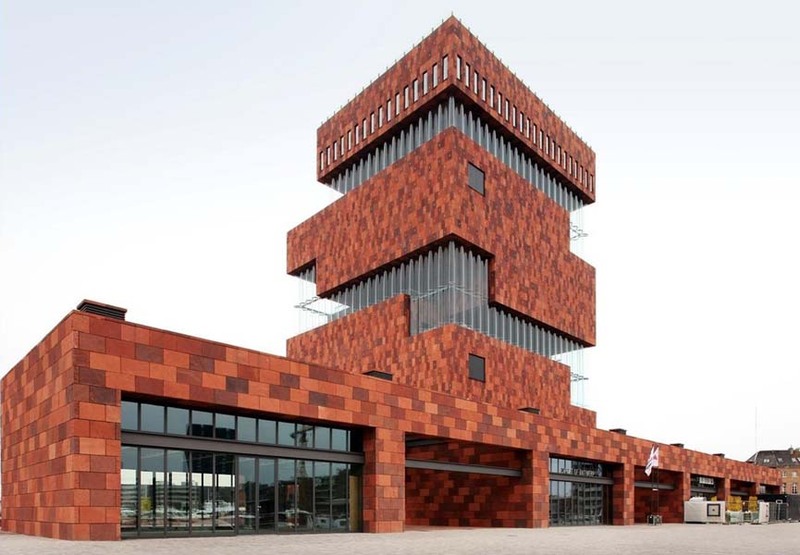 Just like the names says, The Museum aan de Stroom (Dutch for Museum at the river), this contemporary art space is located along the river Scheldt in the Eilandje district of Antwerp, Belgium. 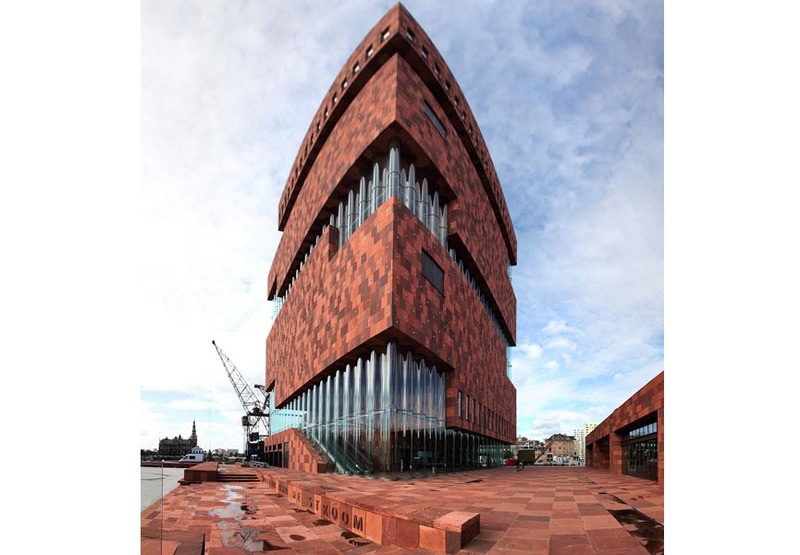 Even though the decision to build the museum was made in 1998, the first brick of the building was laid in 2006 and the museum eventually opened in May 2011, becoming the largest museum in Antwerp. The year before, museum objects arrived from various other museums like the Etnographic Museum and the Maritime Museum, which both closed. The central focus of the museum is the city and its many aspects. The main themes are Metropolis, Power, Life and Death, and Antwerp’s long history as a major international port. The museum is committed to informing the public using new media. 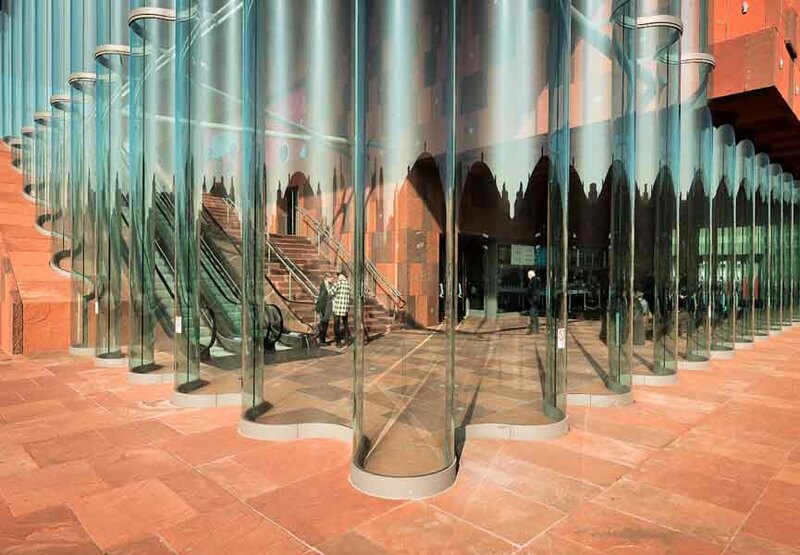 Designed by Willem Jan Neutelings, the nine-storey art space allows the visitors to gaze at the city through large picture windows and looking it from outside, it fits perfectly with the surrounding, making it making it the pride of the city. 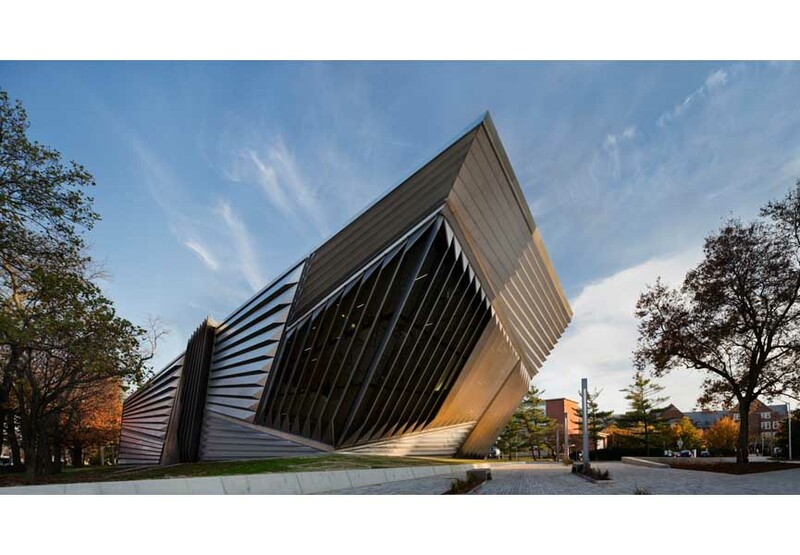 Perhaps the best example of what architecture can achieve is The Modern Art Museum of Fort Worth located in Fort Worth, Texas. 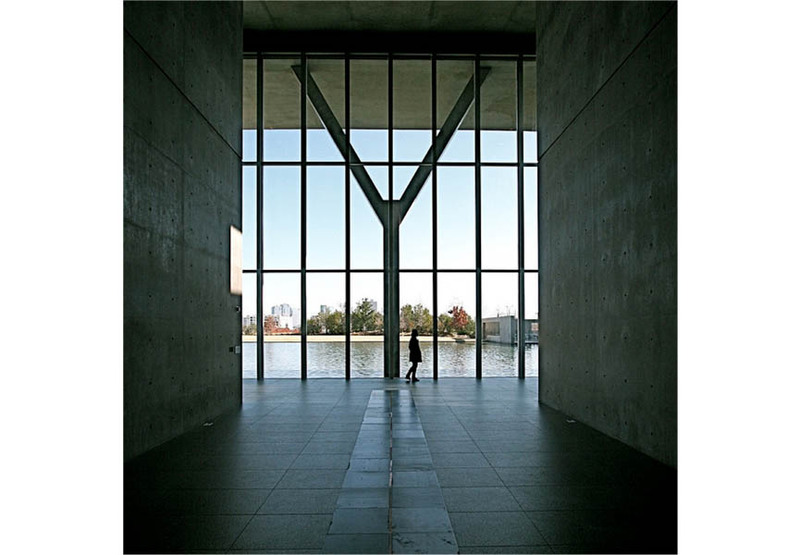 A masterpiece by the Japanese architect Tadao Ando, it combines simple geometry, incorporation of the natural environment, and very minimal material selections. 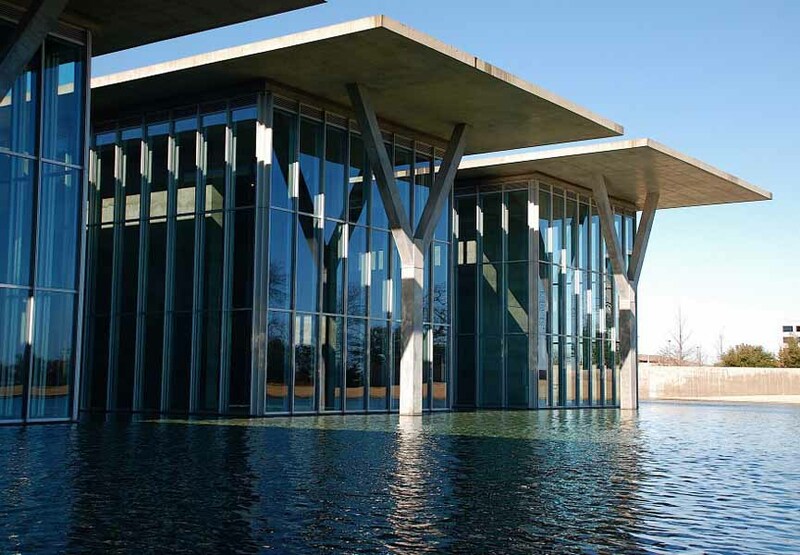 Named one of the World’s Most Beautiful Art Museums by Travel + Leisure magazine, The Modern Art Museum of Fort Worth consists of five long, flat-roofed pavilions that appear to float on the water. 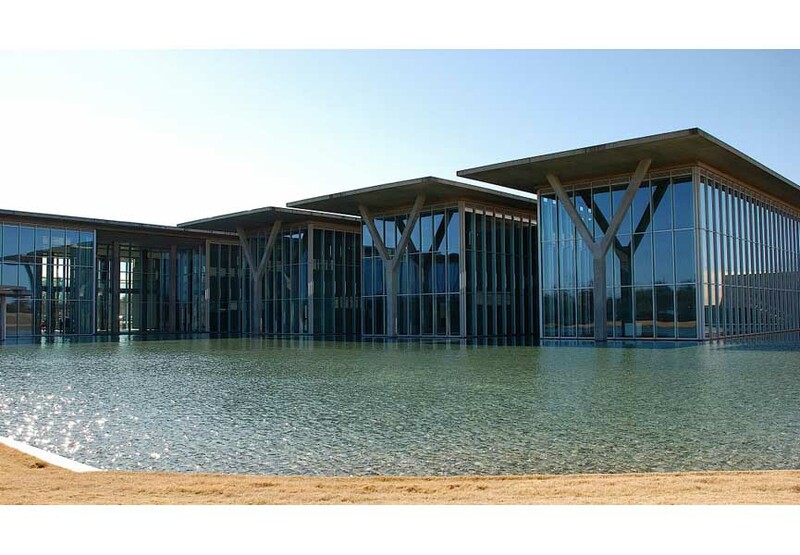 Constructed with only concrete, steel, aluminum, glass and granite, the museum is perfectly reflected in the surrounding pond. Beautiful trees and hills surrounding the museum give the sense of Japanese style. The permanent collection includes more than 3,000 works including pieces by Pablo Picasso, Anselm Kiefer, Robert Motherwell, Susan Rothenberg, Jackson Pollock, Gerhard Richter, Richard Serra, Andres Serrano, Cindy Sherman, and Andy Warhol. 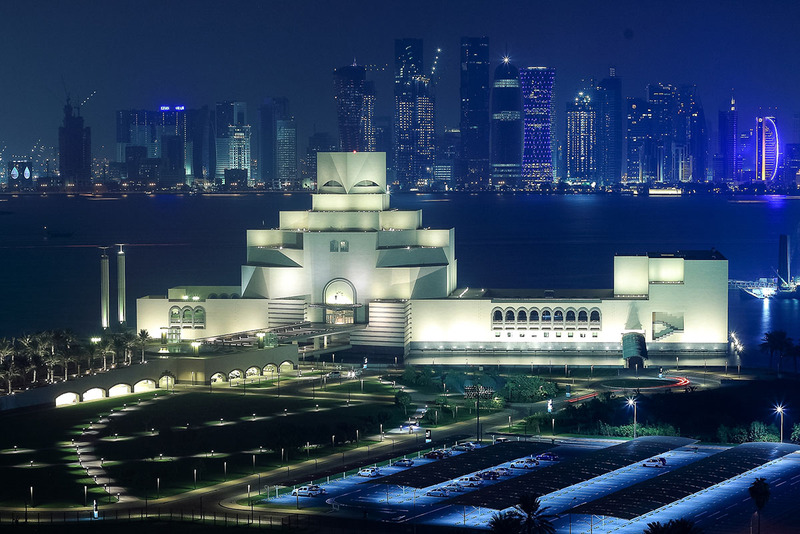 One of the most spectacular venues in the already spectacular Doha, the capital of Qatar, certainly is the Museum of Islamic Art, which was designed by architect I. M. Pei, who came out of his retirement for this occasion, in 2008. He traveled throughout the Muslim world on a six-month quest to learn about Muslim architecture and history and read Muslim texts to draw inspiration for his design. The building, evidently inspired by the Islamic architecture, has a unique appearance, occupying a total area of 45,000 m2 on a stand-alone island surrounded by a park. 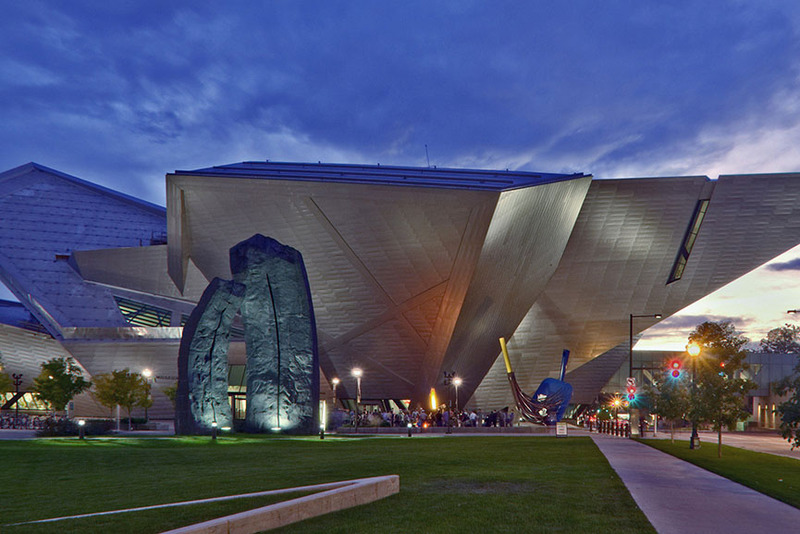 It houses art from a period spanning over 1400 years and covering three continents. There, we can find metal work, ceramics, jewelry, wood work, textiles and glass, as well as manuscripts and Islamic artefacts, originating in Spain, Iran, Iraq, Egypt, Turkey, India and Central Asia. The venue also hosts numerous exhibits throughout the year, dedicated to Islamic art and its artists and prominent figures. Designed by gmp Architekten as recently as 2010, as part of the millennial celebrations, The Hanoi Museum in Vietnam occupies an area of nearly 54,000 square meters embedded in a park with ample water features. 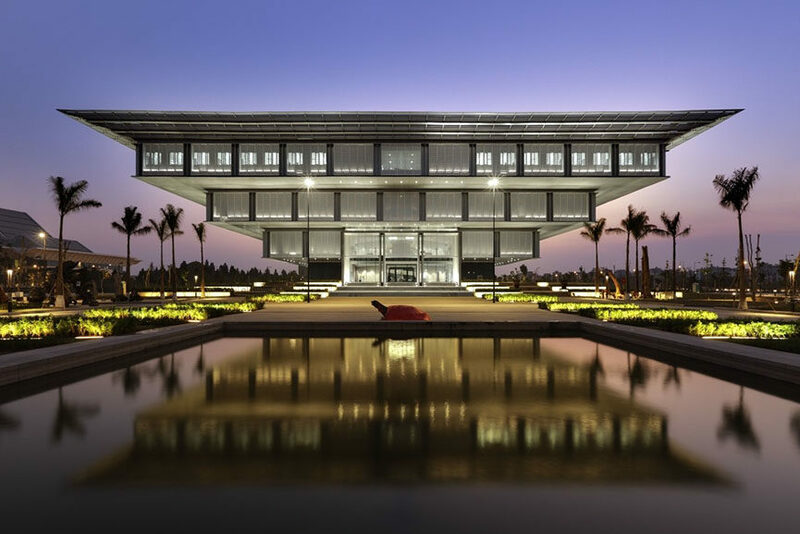 This stunning looking building of an inverted pyramid displays over 50,000 artifacts from Hanoi’s 1000-year history and the history, culture, heritage and architecture of the country at large. 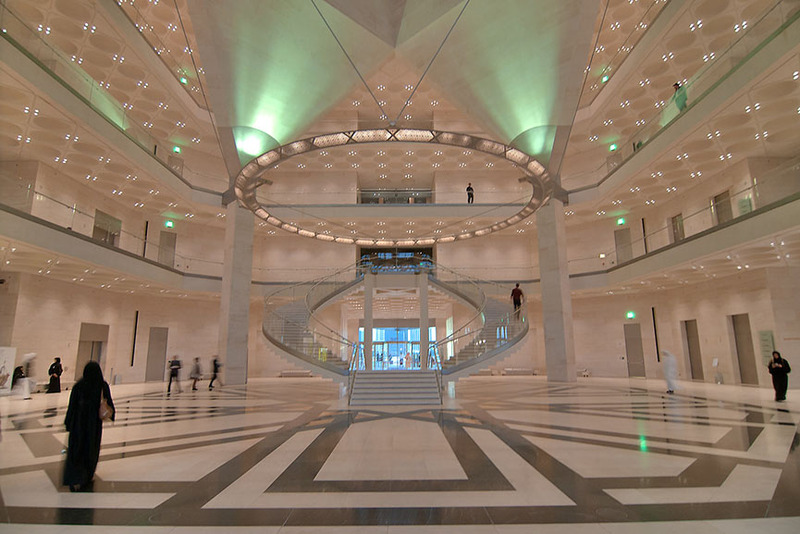 Within the square building, a central circular atrium links an entrance level with the three exhibition levels. The most modern remnant of Vietnamese art, The Hanoi Museum collection includes stoneware, copper pieces, ceramics of the Ly, Tran, Le and Nguyen dynasties, as well as ceramics from China and Japan. The display area of the museum is divided into three parts: Hanoi Natural History; Hanoi history from the foundation of the country before the August Revolution and Hanoi from history after the August Revolution in 1945 to the present. How would you expect a Salvador Dalí museum to look like? Eccentric like the artist himself, of course! 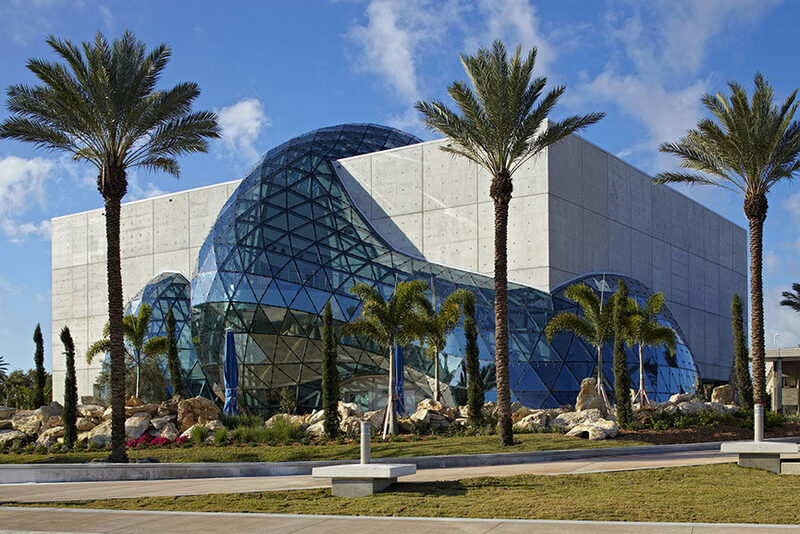 The Salvador Dalí Museum in St. Petersburg in Florida is a concrete and glass structure that houses the biggest collection of the artworks by the Spanish artist outside Europe. It was carefully built over the years by A. Reynold Morse and Eleanor R. Morse, who ended up being patrons and friends of the artist as well, having organized multiple exhibitions during his life. The museum, which opened in 1982 at its current location, includes 96 oil paintings, over 100 watercolors and drawings, 1300 graphics, sculptures, photographs and objets d’art, as well as an extensive archival library. For instance, here you can find The Hallucinogenic Toreador and The Discovery of America by Christopher Columbus, along with 5 more masterwork Dali paintings. 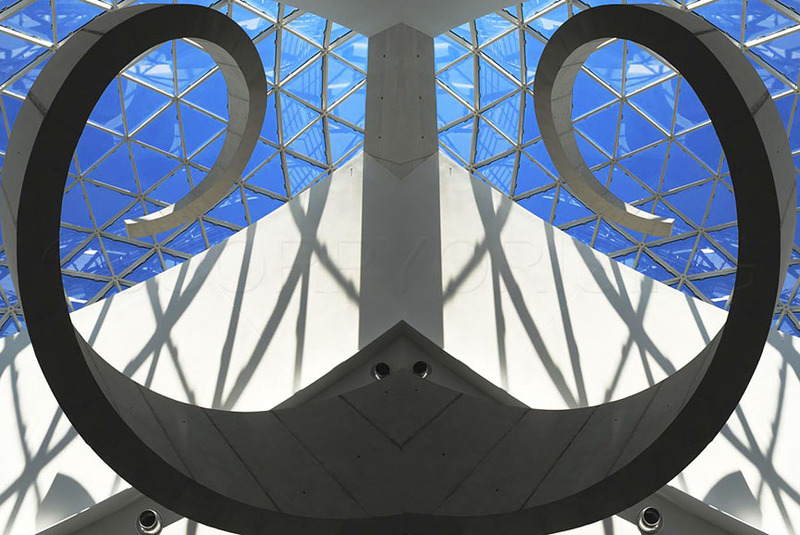 The museum aims to educate the public and promote understanding, enjoyment and scholarly examination of art through the exhibition of works by Dalí and artists of similar vision. Explore some amazing works by Salvador Dali on our Marketplace! Do you remember the famous Water Lily Pond painting by Claude Monet? 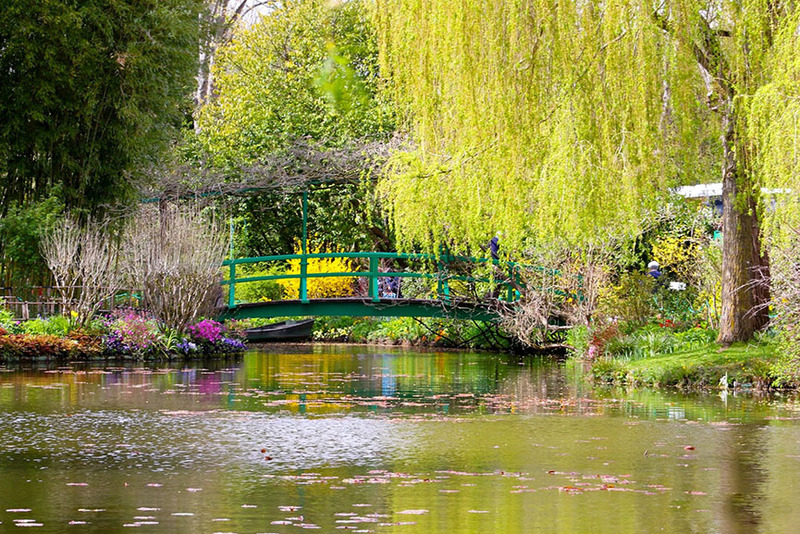 Some 80km northwest of Paris, you can find the very bridge and pond that inspired the celebrated Impressionist, as part of the Claude Monet’s House and Gardens in the town of Giverny. 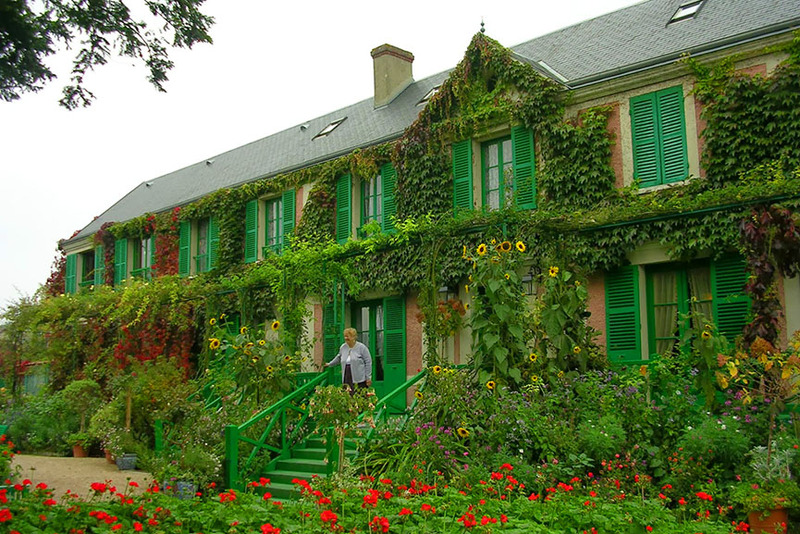 Oozing in nature and plants, the building was Monet’s house, which he bought in 1890 after renting it for a few years. The gardens are his own creation, as if he wanted to give life to his own inspiration, the scenery which would later be depicted in his most fascinating artworks. The house contains Monet’s studio-sitting room and his exceptional collection of Japanese prints, while the gardens are composed of the Clos Normand, with its flowerbeds, and the Water Garden, planted with oriental vegetation and weeping willows, its Japanese bridge painted green and its waterlilies. You can visit it from April to November each year. 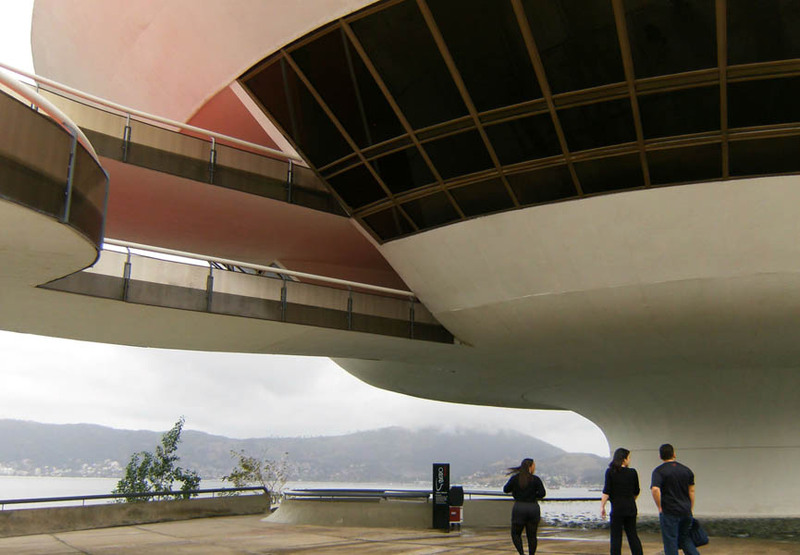 If the building of the Museu Oscar Niemeyer reminds you of an eye, you should know that you’re on the right track! 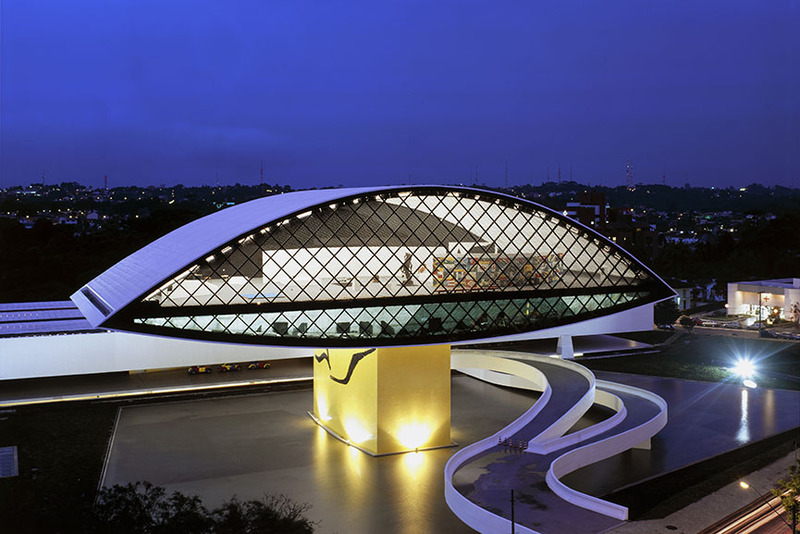 This remarkable structure of the famous architect, made of glass and steel to provide natural light to the exhibit space, was actually an annex to the Oscar Niemeyer Museum, which was completed and opened to the public in 2003; the then Novo Museu, inaugurated the year before, was then renamed into its current name. 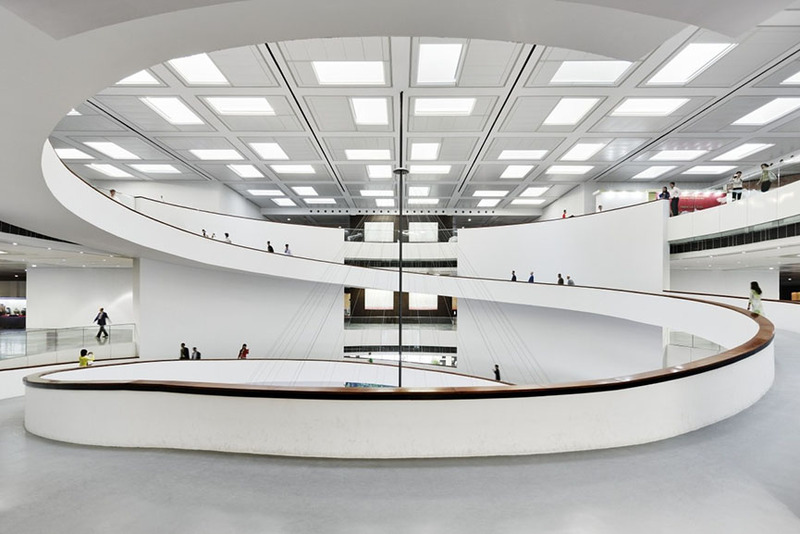 Located in the city of Curitiba, in the state of Paraná, Brazil, the institution is focused on visual arts, architecture and design, exhibited over 19,000 square meters of space. With a total of 12 exhibition rooms, each year more than 20 exhibitions are held, which together receive an audience of more than 300 thousand visitors. MON also has the Educational Action sector that serves students, teachers and the public in general, as well as courses and workshops open to the public, as well as the Documentation and Reference Center with a collection of more than 9,000 publications and journals for research. 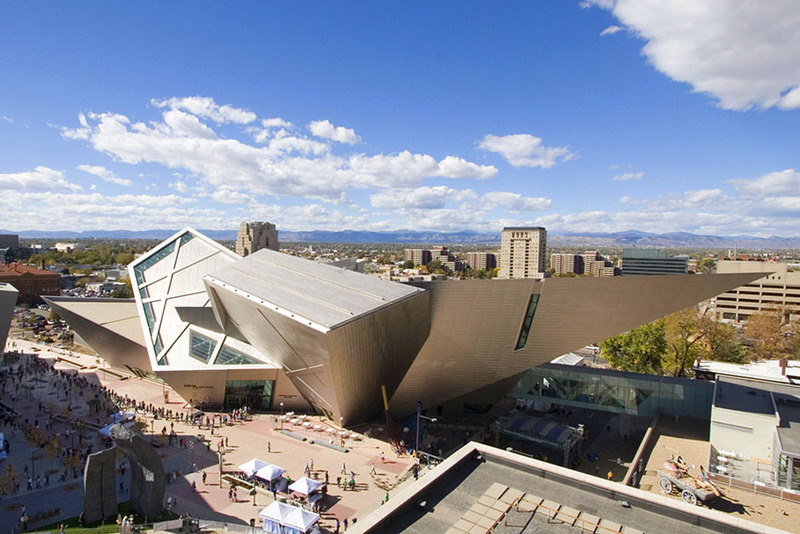 The largest venue of its kind between the West Coast and Chicago, the Denver Art Museum has origins that can be traced back to the founding of the Denver Artists Club, all the way in 1893. It is currently spreading across three venues: the North Building and the Duncan Pavilion, designed by Gio Ponti, the Frederick C. Hamilton Building, by architect Daniel Libeskind, and the Bannock Administration Building. It is known for its collection of American Indian art, as well as the Native arts of Asia, Africa and Oceania; New World collection, including pre-Columbian and Spanish Colonial, European and American painting and sculpture, photograph, Western and textile art, as well as fashion. The DAM’s Modern and Contemporary Art collection encompasses over 12,500 works made since 1900 and includes works by artists including Pablo Picasso, Marcel Duchamp, Henri Matisse and Georgia O’Keeffe, as well as 33 paintings, drawings and collages by the acclaimed abstract expressionist Robert Motherwell. Featured images via museeum.net. All images used for illustrative purposes only.